This 5MP 35 mm lens was designed for 2/3" CMOS/CCD sensors having pixels as small as 3.5µm. 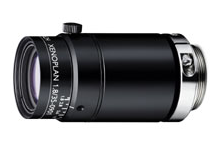 The APO-Xenoplan lenses feature apochromatic correction. With an initial aperture of f/1.8 and very good transmission due to its broadband coating, this lens is extremely bright, making it ideal for the entire spectral range of 400 - 1000nm. "LEAD TIME MAY BE INCREASING -- PLEASE CONTACT US FOR CURRENT STATUS."